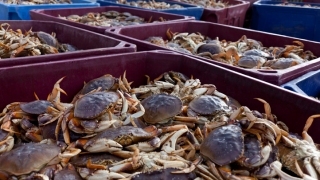 File image shows crates of Dungeness crabs. The Half Moon Bay area was supposed to get its own Dungeness crab festival in 2016. Now, because the commercial Dungeness season has been put on hold indefinitely due to toxic algae blooms causing crabs to ingest a poisonous and potentially deadly neurotoxin, the festival has been renamed and reangled to draw awareness to broader seafood concerns. The SOS Seafood Fest will be held in Princeton-By-The-Sea on Jan. 30-31. The family-friendly festival will encompass a sustainability symposium, live music, food trucks, arts and crafts, beer and wine tasting and a kids' play zone, with proceeds to benefit local organizations including Mavericks Coastside Foundation and the Cabrillo Education Foundation. Organizers say the Half Moon Bay Crab Fest will launch in 2017, if conditions improve.